Today I'm going to review an app available on Android & iOS- ESPN Fantasy App (formerly ESPN Streak). The web version of this app is also available. 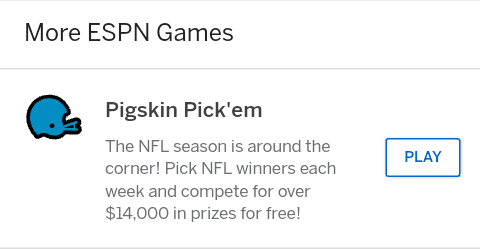 Like the name suggests it is a fantasy sports app... actually it is one of a kind app which lets you win thousands of dollars and never charges you anything. The app seems too good to be true right? -Giving away huge cash prizes for nothing- So it's natural for you to be suspicious. But you don't have to worry about its legitimacy at all. Because ESPN is the proud owner of this app. That name is enough to prove its legitimacy. You just need to pick one from two options in a Prop in ESPN Fantasy app. You can only make one pick at a time. However, you can change your pick anytime before the match starts. If your pick is correct your streak will be W1. 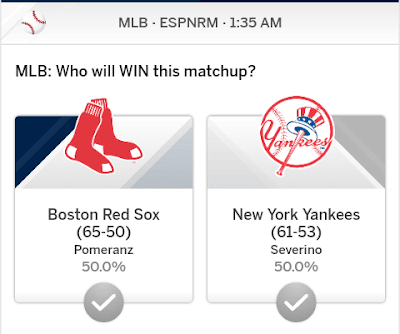 In the same way, if your picks are correct your winning streak will increase. But once you make a wrong pic (your pick loses) Your streak will become L1. Now you will have start again from the beginning. 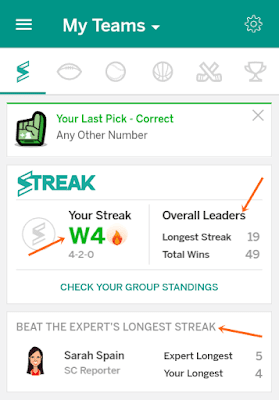 Let's understand it in this way: Say your streak is W10, and your pick loses. This will break your streak and make it L1. And if you lose another one it will become L2. And if you win the next match up you streak will become W1. You can also forfeit your pick. It is the same as losing. Your streak will become L1 (if you lost for the first time). By forming the longest streak in the month you can win the prize of $25,000! This is the highest cash prize so obviously, it is most difficult to get your hands on. You can see the overall longest streak and your streak on the home page. To win this prize of $5,000 you will need to have the most wins during the month. You don't have to form a streak. Just your winnings are counted. Each month ESPN Fantasy will assign an expert to your and every ESPN Fantasy App users'account. The users are required to form a streak longer than the experts. For example, this month's expert is Sarah Spain and her longest streak is 5 and mine is 2. You can see that they are not difficult to beat. But not all the users who beat them are awarded. 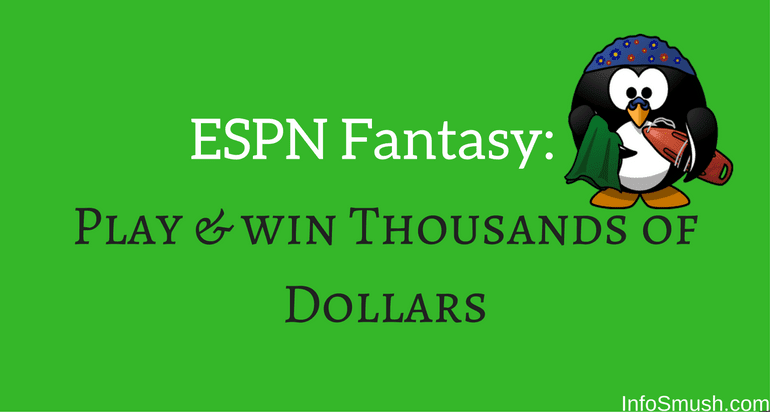 ESPN Fantasy will award 5 random persons who beat the expert at the end of the month. Each winner gets $1,000. There are also some events where you can extra cash. Here you can win up to 14,000 dollars. ESPN Fantasy App is one of the apps that I recommend. This app won't take much of your time and is simple to use. The best part- You can win thousands of dollars without even spending a penny. Do you know any other app to make money online? Please share your knowledge and help others make more money.